The Artists of Ampilatwatja were part of an exhibition in London which was very successful and where twenty two of the exhibited paintings were sold. A dispute arose between the gallery and the artists as to the calculation of the amount owed to the artists and the return of the unsold works. In most cases, Arts Law's Artists in the Black program can provide very little help to artists in dispute with internationally based galleries or businesses. We can only advise on Australian law and it is extremely difficult to recover money or property from overseas. However, on this occasion, Artists in the Black was able to engage international law firm DLA Piper to provide the services of a lawyer based in the United Kingdom on a pro bono basis. Solicitor Luke Holmes negotiated a successful resolution of the dispute that involved the return of the remaining unsold artworks and agreeing upon the amount of the final payment. Doing business overseas can be fabulous for raising your international profile and accessing new markets but it is very risky. Make sure you are dealing with someone reputable and trustworthy. If things don’t work out, it will be difficult and expensive to enforce your contract. In addition, it is always worthwhile making sure that your contract is clear and unambiguous so that when a dispute does arise, you know where you stand. Artists in the Black (AITB) client Mandy Davis has received a settlement following the commencement of legal proceedings for infringement of her copyright and her moral rights. 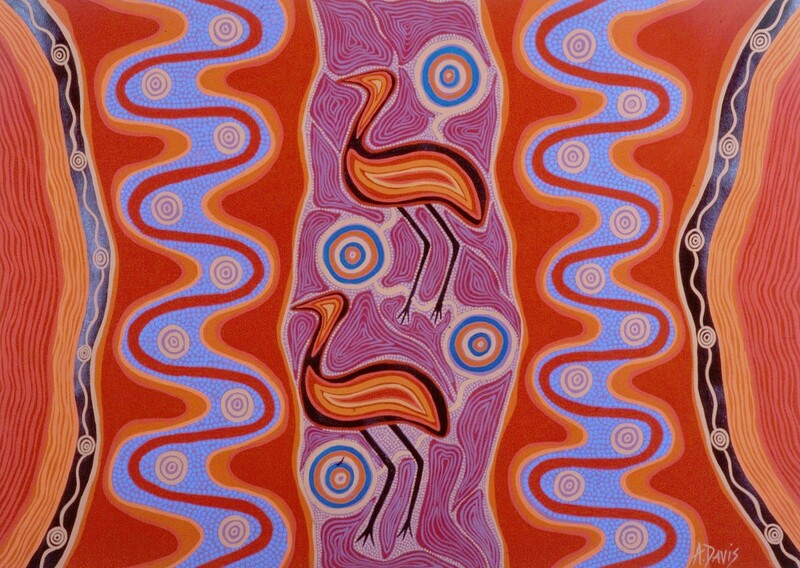 Mandy Davis is a successful artist from the Worimi people from the Great Lakes district in Northern NSW. Davis has been painting since 1990 and several of her works have been licensed for use by companies and government agencies. She has had national and international exhibitions. In 2005, Davis saw her painting Emu copied onto a commercial vehicle without her permission. She recalls "My first reaction was disbelief and then I was embarrassed as the artwork was distorted and didn't reflect the true design I had created." Mandy contacted AITB and we harnessed the support of a law firm, in this case Clayton Utz, who could work to achieve an outcome for our client. EMU © Mandy Davis. Reproduced with permission of the artist. The main issue was the infringement of her copyright in the work, coupled with infringements of her moral rights of attribution and of integrity and of attribution. The company distorted her artwork when reproducing it on the commercial vehicle: the colours were changed and there was no attribution of Davis as the original creator. These actions were all the more hurtful to Davis as her designs and artworks illustrate her cultural beliefs and values and her connection to her ancestors. After several letters of demand remained unsuccessful to resolve the matter, legal proceedings were commenced in the Federal Magistrates Court. Before the matter went to hearing, further discussions resulted in an agreement to remove the infringing artwork from the vehicles and the company’s website. The terms of the final settlement are confidential. Artists in the Black appreciated the support of Clayton Utz, which took the matter on a pro bono basis and donated over pro bono 140 hours. This matter was run by senior associate Nicholas Tyacke and IP litigation partner Peter Knight. Barrister Richard Cobden SC also provided his services on a pro bono basis representing Davis in court. This matter not only demonstrates how pro bono work makes a difference; it also illustrates how copyright law can sometimes be used to protect Indigenous cultural integrity. Mandy Davis says that "being involved in a court case gave me an insight into the legal side of copyright and what our moral rights are….Hopefully the company that used my artwork learned something out of the whole process and most importantly that what they did was morally and culturally wrong." 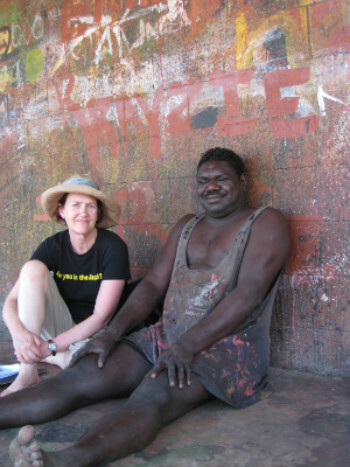 Gabriel Maralngurra is a longstanding member of Injalak Arts at Oenpelli on the eastern border of World Heritage listed Kakadu National Park. Gabriel has exhibited to acclaim throughout Australia, as well as in Europe and the USA. He has been a four-time finalist in the Telstra National Aboriginal and Torres Strait Islander Art Award and his works are held in important collections across Australia, including the Melbourne Museum. When Gabriel was a very young man, a non-profit outstation resource centre at Oenpelli was given one of Gabriel's drawings to use as its logo (trade mark). His drawing appeared on planes, trucks, stationery and signage for about twenty years. Gabriel knew nothing about copyright or moral rights. He didn't know that his permission was required or that he was entitled to ask for payment and attribution. He was proud to see his work used in this way but disappointed that he was never acknowledged. In 2008 Artists in the Black visited Oenpelli and heard this story. We asked our pro bono lawyers at Freehills to draft a letter on Gabriel's behalf asking the resource centre to acknowledge Gabriel as the artist and suggesting that some payment was appropriate for such a long period of use. The resource centre is an important part of the community at Oenpelli and Gabriel was happy for his drawing to continue to be used. This was not a letter of demand but a letter proposing a solution to a situation in which Gabriel's moral right of attribution had not been respected. The resource centre had not considered these issues before and was very happy to agree to the proposal. It acknowledged Gabriel's rights as artist and copyright owner and agreed to identify Gabriel as the artist on all its official publications and electronic media. It also made a generous payment to Gabriel in recognition of the long use of his drawing and its importance as part of the resource centre's branding. It is important to understand your rights of copyright and your moral rights. If someone wants to copy or use your art as a logo or trademark you may be entitled to ask for payment or acknowledgement and have a say about how your art can be used. It's best to do that when the use is first proposed but this case also demonstrates how lawyers can help to negotiate a better result even after a long time. 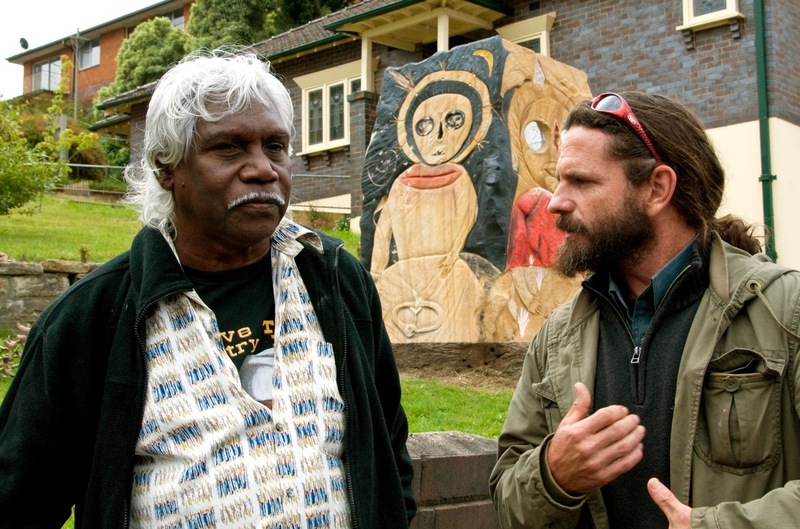 Kimberley elder Donny Woolagoodja and local Darug man Chris Tobin standing in front of Wanjina Watchers in the Whispering Stone- Sculpture by Benedikt Osvath - Photo and © by Rein van de Ruit. Although the sculpture was clearly a Wandjina, it did not appear to be a copy of any particular artwork by a known artist and therefore no complaint about infringement of copyright could be made. Copyright protects individual creators of artwork – this situation concerned rights regarded as traditional or communal rights to an aspect of Indigenous culture (also called Indigenous cultural intellectual property or ICIP). Artists in the Black has long been advocating for protection of ICIP but legislative reform is yet to occur. We looked for another solution. The sculpture was positioned outside the gallery visible from the street and therefore required planning approval from the Blue Mountains Council. Together with the Environmental Defenders Office, Artists in the Black drafted submissions to Council in opposition to the application for development approval which had been lodged by the gallery. 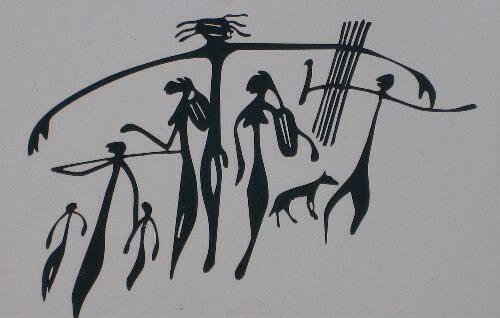 In October 2010, the Council rejected that part of the application which related to the sculpture stating: "the sculpture contains an interpretation of sacred Aboriginal images that is offensive, disturbing or distressful to some members of Aboriginal and non-Aboriginal communities, including local representatives of those communities, as evidenced in public submissions, and consequently has an adverse social impact and is not in the public interest…"
This case highlights the current gaps in protection provided to Indigenous cultural and intellectual property (ICIP) under Australian laws. 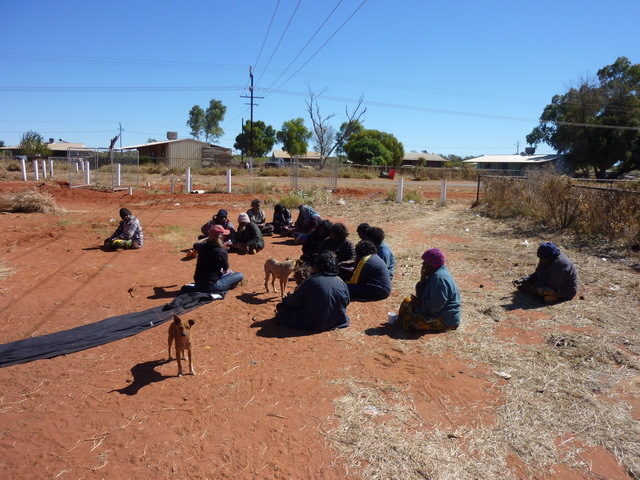 It also illustrates how sometimes other laws can be used to protect cultural heritage. Artists in the Black hopes that this case can be used to demonstrate the need for stronger legislation to protect ICIP.